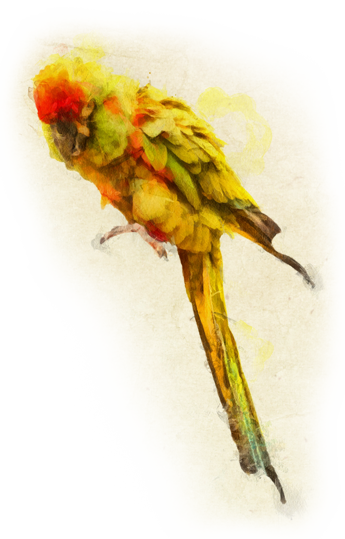 Parrot Productions – Party with Parrots! In 1980, my children were 4 and 5-years-old. My first bird was a green-cheeked conure. It snapped its beak at me, drawing some blood several times. I did not like it very much, even though it was beautiful. I wanted more. I bought a bigger bird, a cherry-head conure. It was wild – afraid and frantic. Then, I had a “Pauly” type conure, younger, smoother feet, darker eyes, captured early in its life. Next, a blue-front Amazon. I found ways to train it: step up, hang upside down, flap his wings, etc. Through observation and experimentation, I learned about parrots. Together with a friend, Tom Gay, TAME was founded in Grand Prairie, Texas. TAME stood for Training Active Management Eoavis (Latin meaning of, to, or about psitacines – hook bill parrots.) We sold only tame parrots that sat out on perches in our store. No bird was in a cage if the store was open. 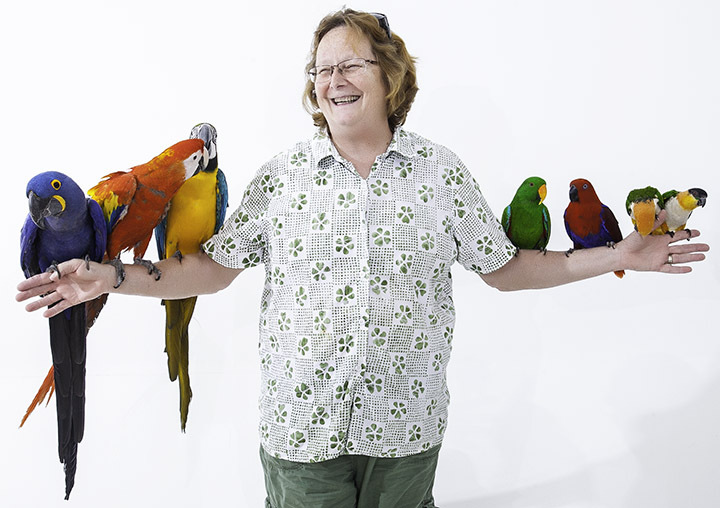 We were the only pet store that specialized in birds that would step up and sit on your hand. We started a training course and taught our customers about parrots: symptoms of illness, proper diet, maintenance, bird psychology and some plain old common sense. Tom taught me much about how parrots respond to a loud noise and constant, persistent, daily routines. At that time, there were only a few very expensive hand-fed domestically-bred babies available for purchase. Many birds were imported after being trapped wild, after flying free. With the great economic “recession” in the late 1980’s, we moved to Georgia and kept only our pets. No one could afford to buy a $1,000 pet and the bird business all over the country faltered. And with those hard times, came the selling of our own beloved pets: a yellow head named Freeway, a white front named Patton, and Gallagher, a yellow-nape. I missed the parrots, their play, their noise and their company – especially when the kids grew up. I was finally able to purchase an Eclectus parrot, Cash, in 2006, still hand-feeding. Then I met my husband, Jack, who came with a blue and gold, Nikki and a scarlet Macaw, Keeli. Nikki and Keeli hated me. Jack’s wife had died and they were traumatized. I understood. I waited. Like a five-year old child, I loved them anyway. And I have been rewarded with their affections, however hesitantly given. Now they ride the dog, the remote control car, put the marble in the cup and they both say, “Mama’s home” when I come in the house! Keeli will follow me, walking on the floor into the kitchen, perch atop my shoe and ‘help’ me get fresh water for his cup. He says “hello, give me ‘kiss, let me out, mmmmmm” and makes the smooching sound of a kiss, even without lips. Nikki will toss the ball to me. That trick started out as an emotional outburst, where she would angrily throw her food bowl at me. Then I learned to catch it and I would laugh. Ha Ha Ha! She went from lunging and striking, drawing blood when I was not quick enough, to gently holding my finger in her beak and resting the white skin of her face against mine. Her grief and anger finally subsided into wary curiosity and then melted into gentle accepting adoration. And that, my friends, is the magic. The love given by a parrot is earned. It is gracious and intangible. How wild is it to be loved by a creature that should fly? How amazing to find they know colors, vocabulary, numbers, and communication!